Jeremy shows some Rio Grande Turkeys and their choice of cover. 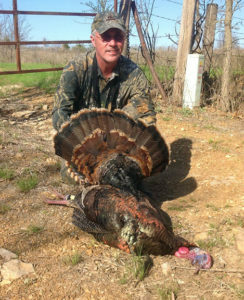 Wild Rio Grande Turkey hunts is a surprise to many that think this species is limited to Texas. Further advantages included no snakes, no cactus, cooler temperatures. We emphasize cover reference to Rio Grande Turkeys more so than Easterns. Those who have hunted Rios elsewhere notice in our country no low lying scrub. Meaning set up, interdict patterns, calling, decoying, works better than any shock call drawing them in or run & gun techniques. What we provide is private land servicing self guided hunts starting with recommendations to spots we have seen tracks, flocks, roosts, toms, etc. From that point onward hunters makes their hunt. Our effort at providing terrain details is to get any hunter oriented to techniques proven by many over years of season which make best hunts. Cut wheat (above) or green wheat is a predominate dry land crop in Rio Grande country. Background wooded drainage is thicker than what is common. 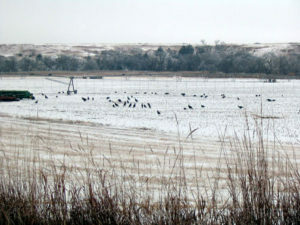 Just as are our Mule Deer, Rio Grandes are regionally specific turkey not indigenous to all of MAHA land holdings. Those who study ground nesting birds know value of environmental limiting factors which geographically separates different species. It is a matter of humidity, altitude, average rainfall and timing of rains. Or, to western Kansas. Shown below, MAHA operating region. Subsets are Rio Grande Turkey. Easterns every where else. Note an overlap. 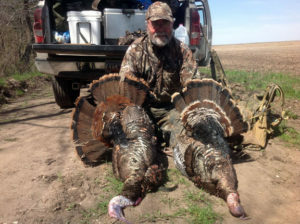 Randy showing an Eastern and a Rio Grande Turkey from one trip he takes each year. We have long recognized where the right environmental limiting factors exist and within that region and we have a thorough understanding of the habitat most frequently occupied. This means Association hunters will be spending their time on good land. Another Randy who travels from the east cost all the way to western Kansas. Looks like an Eastern than Rio, from deep into Rio Grande country. No hoping, wishing or wanting. Long before any hunter leaves home he will know exactly where he will hunt. Where he will have made lodging reservations. May purchase his licenses online. Or, over the counter once out here. All anyone has to do is simply talk to us by telephone, travel out here, when he arrives he goes straight to his reserved spot then hunts. On his own separated spots from others. Additional options at one Association cost. Simply by traveling over to Missouri hunters may purchase two more tags to continue his fun. That is two over counter tags in each state, four tags total, between Kansas and Missouri. Two states, two bird species, on one trip. We also have leases in Iowa giving a fifth spring tag. 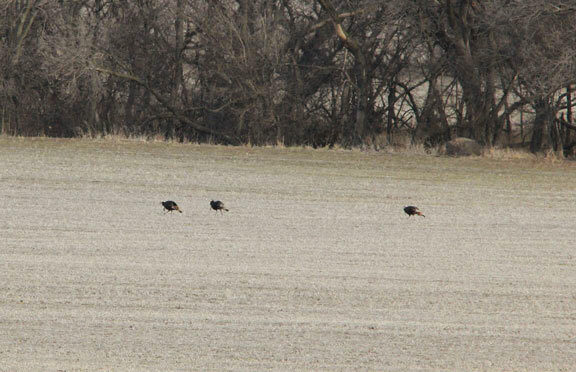 Continuing advantages inclusive of one cost allows turkey hunts plus Mule or Whitetail Deer hunts as well.